Jordan Woy (J.D. ’87) negotiated his first major league contract while attending St. Mary’s University School of Law. The contract was for now-retired Major League Baseball left fielder Pete Incaviglia, making Incaviglia one of a handful of players to ever get a major league contract straight out of college. After graduating, Woy dove into the sports world. There weren’t many full-time sports agents, especially for NFL players, because negotiating NFL players’ contracts wasn’t in the rules. Unless teams traded them, players were stuck playing for the same team or had to retire. That changed in 1993, when the NFL introduced free agency. 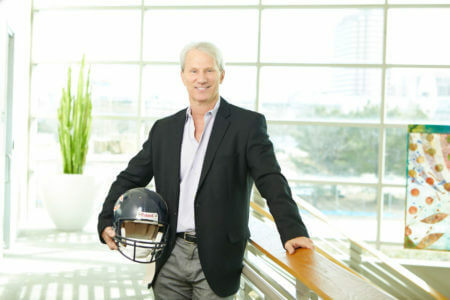 “I realized that getting veteran clients who were about to become free agents was a big business,” said Woy, who now co-owns Willis & Woy Sports Group LLC in Dallas. became the then-highest-paid offensive lineman in the NFL. Woy’s clients have included former Dallas Cowboys players, such as outside linebacker Anthony Spencer, offensive tackle Flozell Adams, wide receiver Terrell Owens and safety Roy Williams. He’s represented players from a number of other teams, including the Green Bay Packers, the Washington Redskins and the New Orleans Saints. Altogether, he has represented more than 400 NFL players. Being a sports agent is a cutthroat business “like high-stakes poker,” but Woy enjoys it. “I’ve become great friends with a lot of my clients, and we’ve stayed in touch,” he said. for the sports agent world, where he plays the role of salesperson, lawyer and manager. “St. Mary’s was a good experience. It prepared me for the next step in life, and it taught me how to prepare and think analytically,” Woy said.